Learn how to start a cleaning business with no money, and find out why limitations can be a good thing. First, let me tell you a secret. Without a lot of resources, you can learn how much you are actually capable of. Without any crutches. With nobody's help. You can uncover a goldmine of creativity within yourself. But there is a catch. You must have a specific goal. And you must write it down. This I firmly believe, because I've seen how effective writing down your goals works, time after time. Look. When you don’t have a lot to spend, your senses are alert to opportunity everywhere. The simple act of writing down your goals for your new cleaning business will focus your mind and help you achieve them. Some people even believe that writing down a goal practically guarantees success. No one ever achieves much without action. So while it is true that writing down your goals will help you focus, it is your actions that lead to success. Take action now. While you're motivated. If you forget everything else in this article, remember this: Your actions in the early stages set a foundation for your future success. Learning how to start a cleaning business with no money is a smart step to take, because it is a problem that solves itself in a very short time. You can earn money quickly, and pay the bills, put gas in the tank, buy the groceries, take the trip you want to take or whatever it is that motivates you. You know the saying about when a door closes, a window somewhere opens? It applies to starting a business on a tight budget. One door may be closed, but windows everywhere are open. The window to finding customers is the one opened by your friends. The window to getting the materials you need is the one opened by your family or anyone else with your best interest in mind. Learning how to start a cleaning service without any money teaches you to see yourself in a new light. You have inner resources that you never dreamed of. Housecleaning is an excellent business to start when you have limited cash flow. That’s because it’s possible to start small and scale it up from there. Not only is it possible, it’s prudent and smart. When you have no money, you have none to waste. People with means often make unwise spending decisions because they have plenty to spare. Look at it this way. Be grateful you don’t have that problem. For your first jobs, the materials you need are probably right in your own kitchen and broom closet. When I first started cleaning, I used my customers' vacuum cleaners and everything else I needed – paper towels, scrub brushes, cleanser. People often prefer you to use their cleaning products anyway. I put the money from those first jobs back into the business, hiring a college student to help me distribute flyers, and grew my business in an organic way. I put down roots. The business began to flourish. In fact when I think about it, it flourished precisely the way I had described it on paper when I wrote down my goals at the start. Many people have learned how to start a business with no money, so you can find a lot of good help out there. But there is one important thing to be aware of, as you learn how to launch your business. It’s not something that everyone will tell you, and it's super important. You must ask for the amount you want and deserve. You're not doing anyone any favors by lowballing your first jobs. So start by defining how much money you want -- and need -- to make. Print off a few flyers at home or on a friend’s borrowed computer. Business growth requires advertising. But to start you can find customers in the simplest way possible. So simple that we often forget to do it. You simply ask. Ask everyone you know. This is how many of clients got started. Cultivate courage if you need to. Be bold. Be sincere. You will be surprised at how helpful everyone in your life can be if they know how to help you. 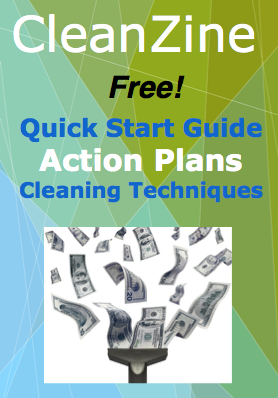 Start a cleaning business with no money. You will quickly discover why limitations are sometimes a good thing.